This is a guest post by Kaitlin Hardy Shetler who delivered this homily on 1 Corinthians 8:1-13 at the All Saints Church of Christ on January 28, 2018. When I read Corinthians, I am struck by how many times Paul connects weakness to holiness. It’s as if the whole letter, peppered with missives to keep the weak in mind—to even change our behavior in favor of the weak—values those who struggle. It shouldn’t be surprising, given that Jesus’s ministry was to the sick, wounded, and burdened, and that Paul, a former Pharisee and Persecutor, was literally weakened by God in order to fully know Christ. The weak is where God resides. The weak is where God shows up. So to God, shaming and shunning the weak isn’t to be taken lightly. I wonder if this is how we typically read this passage in Corinthians? Do we see the “weaker brother” as an opportunity to be compassionate and empathetic, or do we see him as a chance to be self righteous and arrogant? Paul says that wounding another’s conscience while it’s weak is tantamount to sinning against Christ. These are harsh words, and the fact that we typically brush by them aside in a rush to proof-text and condemn, should give us anxiety. We see the “weak” as “sinners” who just can’t control their urges or ignorant children who don’t understand God like we do. But we totally miss the fact that these individuals aren’t any less faithful or spiritual—they are just…burdened. Wounded. In youth group, I remember ministers using these words to describe people who drink or swear. That was the extent of the exegesis of these verses, and even as a teenager, I felt it was missing the spirit of what Paul’s saying. And I believe that’s because it’s easy to use this passage address sins, but it is harder to see it as addressing woundedness. Because that requires more work than just “not drinking”—it requires a deep sense of empathy and the ability to take another’s perspective. It requires putting aside one’s arrogance, and adopting the difficult stance of embracing another’s pain, woundedness, and weakness—walking alongside it and recognizing that any actions that would further wound that person are condemned by Christ. When we talk about this, we’ve got to define our terms. Who are the wounded? Who are the weak and powerless? And why do they deserve our consideration over those who see themselves as enlightened and unburdened? We can reframe this as understanding power dynamics. When we examine any situation, we have to ask ourselves, “Who has the power?” Weak people don’t have power. Wounded people aren’t historically centered in these conversations. Keeping in mind the weak means that we recognize this social fact. Socially, in Paul’s day, the weak were the disadvantaged, the oppressed, women, minorities, and the underclass. In our day…it’s the same. And that narrative is a death sentence for someone’s faith. We are bombarded by powers and principalities that constantly wound and weaken humanity. Racism and sexism exist deep within the fabric of our society, and abuse runs rampant in our world. We cannot sit in a congregation without coming into contact with at least one person deeply touched by this evil. So we can’t walk away from people, puffed up in a false knowledge that says, “Just get over it. It’s not a big deal. We all know this world is not our home.” That is not empathetic, compassionate, or accurate. It does nothing except exert arrogant power over the wounded individual. And, according to Paul, it is sinful. Paul is calling for empathy. And this empathy must flow in the direction of the weak and wounded. Not the abuser. Not the privileged or advantaged or rich or powerful. It must surround like a gushing river the souls and consciences of those hurting. In these instances, we must think to ourselves: “Does my treatment of this issue lead someone closer to or further away from Christ?” “Does it further wound them, or does it grant them healing?” And our priority is always to the least of these. With that in mind, allow me to present an alternative reading of this passage. Now concerning racism, sexism, sexual assault, and all those other worldly evils: we know that “all of us possess knowledge.” Knowledge puffs up, but love builds up. Anyone who claims to know it all actually doesn’t; but anyone who loves God is intimately known by God. Hence, as to these evils, we know that “Christians are transformed by the renewing of their mind,” and that we “forgive as God forgave us.” Indeed, even though there may be evil in this world—as in fact there is hate and prejudice and abuse— for us there is none, for all are equal in the eyes of the Lord. It is not everyone, however, who has this experience. Since some have been abused and persecuted and harmed (and in fact, are still suffering the effects of this), they still see these evils as realities and hear the dismissal of them as approval of their suffering. Their souls and bodies, being wounded, are weakened. We are no worse off if we do not “forgive and forget”, and no better off if we do. But take care that this liberty and privilege of yours to ignore these evils and focus on “things of above” does not somehow become a stumbling block to those who have been wounded by the here and now. For if others see you, who live a life free of these experiences, making light of them and acting as if they don’t have any impact on people, might they not, since they are wounded, be encouraged to the point of harming themselves and their faith? So by your arrogance those wounded and hurting believers for whom Christ died are destroyed. But when you thus sin against members of your family, and wound their faith when it is weak, you sin against Christ. Therefore, if denying their experience, if inviting those who caused them pain to break bread with them, if asking them to forgive and forget is a cause of their falling, I will never do these things, so that I may not cause one of them to fall. God is a God of the weak and wounded, and he will not forsake them. He will not tolerate an arrogance that dismisses their experiences or devalues their existence. This passage is not about eating or drinking—as Paul says, that is beside the point. This passage is about compassion and empathy and the ability to take the hurting into our community and show them that they are more important than a theological debate or a self-righteous posturing. This exists as a warning to us: God’s heart is wounded. Christ was made weak. Worldly power has no place in the church. We are called to bear with one another. Not doing so is not bearing with Christ. May we be spurred to the good work of embracing the wounded and weakened, and by our actions and support, bring them closer to God and the hope of a world free from oppression and abuse. Though 1 John is anonymous, tradition associates it with the Apostle John or perhaps Elder John who are both connected to churches in Asia Minor in the late first century. Whatever the case (and I will call the author “John”), it is rather immaterial to the themes and meaning of the text. 1 John begins and ends like a “tract,” or even homily (sermon). It does not have the form of a letter (unlike 2 John and 3 John). It is more like a community handbook intended for a region of congregations. We might imagine the author seeks to provide perspective given the recent turmoil congregations in Asia Minor (or a larger region) have experienced. Consequently, the “letter” (I use term accommodatively) functions as a handbook for communities as a way of orienting them toward the central truths that should shape their communal life. These congregations have recently suffered a division where some left and established alternative communities. They seceded from the original congregations in order to maintain their own theological agenda. At the core of this secession was the belief that Jesus did not come in the flesh, or what is called “Docetism” in the early church (1 John 2:19-22; 4:1-2, 7). Interestingly, when Ignatius of Antioch pens letters to several congregations in Asia Minor around 112 CE, he recognizes there were competing congregations in the area, and some of those congregations were “Docetists,” that is, they denied the Son of God had come in the flesh. The author of 1 John considers this a denial of a central truth of the Christian community, and bids the secessionists farewell as long as they persist in this belief. John addresses this situation by reminding these churches of two important truths, which fundamentally ground Christian communities. These two truths organize the “letter,” which is an exposition and application of these truths to the post-secessionist situation in which these churches find themselves. The first truth is: “God is light” (1 John 1:5). This is, as John writes, “the message we have heard from him and declare to you.” It is, literally, “the announcement” we “announced.” It is a fundamental message of the Christian community. 1 John 1:5-3:10 develops this theme. The light of God is revealed in the incarnate Jesus, who calls us into a life of purity, truth, and righteousness as we walk in the light as Jesus lives and reveals that light. Consequently, we recognize the Christianity community is fundamentally different in its values and mission than the rest of the “world” (as John uses the term) precisely because this community is founded on the light that Jesus revealed through coming in the flesh. The second truth is: “God is love” (1 John 4:8, 16). The second “announcement,” that “we should love one another,” is grounded in this truth (1 John 3:11). Indeed, this is the “new commandment” that shapes the Christianity community (1 John 2:7-8). These two truths—“God is light” and “God is love”—are revealed in the incarnation, ministry, and death of Jesus the Messiah. The church confesses Jesus as the Messiah who came in the flesh, and this coming revealed the light and love of God. This is the heart of the Christian faith, and it is this message (“announcement”) that makes a community an authentic, living embodiment of God in the world. Indeed, as the prologue (1 John 1:1-4) and epilogue (1 John 5:13-21) make clear, Jesus is the “eternal life” through whom God is revealed and through whom we participate in the life of God. We enjoy “eternal life” as we participate in the light and love of God experienced and known through Jesus. Consequently, we “know” that light and love when we entrust ourselves to God through Jesus and become children of God (1 John 5:13). As children, we walk in the light of God, and we love each other. As a summary of early Christian steadfastness, Acts 2:42 has served as a influential reference point in the Believer’s Church tradition, and it has been especially important to the Stone-Campbell Movement. As early as the 1830s some even regarded it as the biblical “order of worship.” Others simply emphasized its fundamental orientation. 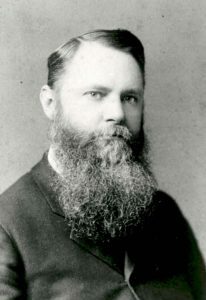 James A. Harding, co-founder of Lipscomb University and namesake of Harding University, called them “means of grace,” that is, four spiritual disciplines that form believers into the image of Christ. Harding identified the four as (1) reading and studying the Bible, (2) ministering to others (especially the poor) as we share (“fellowship”) our resources, (3) participating in the Lord’s day meeting at the Lord’s table as a community, and (4) habitual prayer. Sometimes Harding identifies these with the Lord’s Day assembly or communal gatherings but generally understood Bible study, missional engagement with the poor, and prayer as daily spiritual disciplines. According to Harding, believers should adopt a kind of rule of life which involves daily Bible reading, “doing good” daily as they have opportunity, and pray every morning, noon, afternoon, and evening. But these are no mere duties. Rather, they are “four great means of grace—appointed means by which God dynamically acts among, in, and through the people of God. They are not modes of human self-reliance but means of divine transformation by which God graciously sanctifies believers. They are spiritual disciplines through which God conforms believers to the image of Christ. Harding’s antidote recommended the “four habits” of Acts 2:42 as expressions of both communal and personal piety. Whoever neglects them will falter and their “falling away is sure.” But if one will pursue these spiritual practices, “he will surely abide in Christ. These four are god’s means of grace to transform a poor, frail, sinful human being into the likeness of Christ.” Whoever “faithfully uses these means unto the end of life can not be lost.” Specifically, in response to the question, “Will God hold us responsible for little mistakes?” Harding answered: God “holds nothing against us” whether we sinned “in ignorance, weakness or willfulness” as long as we live in Christ as people who faithfully practice these spiritual disciplines with a heart that seeks God. God in Christ through the Spirit is graciously active through these communal and personal faith-practices. God actively transforms believers into God’s own image, and believers who pursue these gifts of grace will experience transformation by divine power rather than by human effort. **This is adapted from John Mark Hicks and Bobby Valentine, Kingdom Come: Embracing the Spiritual Legacy of David Lipscomb and James Harding (Abilene: Leafwood Press, 2006), 75-77. One chapter is devoted to each of these means of grace. Harding, “Scraps,” Gospel Advocate 27 (9 February 1887), 88. Harding, “Questions Concerning the Way to Heaven,” The Way 4 (12 February 1903), 370. Harding, “Questions and Answers,” The Way 4 (17 July 1902), 123. Harding, “Scraps,” The Way 5 (23 July 1903), 735. Harding, “Scraps,” The Way 5 (15 October 1903), 945. Harding, “About Protracted Meetings,” Gospel Advocate 27 (14 September 1887), 588. Harding, “Ira C. Moore on the Validity of Baptism,” Christian Leader and the Way 23 (18 May 1909), 8. Harding, “Scraps,” The Way 4 (26 February 1903), 401-2. I know those feelings. I’ve been overwhelmed by them at times. They have felt like a ton of bricks on my chest, and I couldn’t breathe. I’m feeling them now. Sitting with Jesus on the beach, eating the fish he grilled and the bread he baked, I keep staring at the charcoal fire. Its burning my eyes and scorching my heart. When Jesus was arrested, I followed him. John had connections in the household of the High Priest, by which we were able to gain entrance to its courtyard. I will never forget that courtyard. Even as I entered it, the servant girl recognized me and said, “You are one of them, aren’t you? You are one of Jesus’s friends.” And I said, “No, I don’t know him.” John looked at me, and I looked at the ground. What came over me? Why would I deny Jesus? It sort of just happened, and the words came out of my mouth before I could grab hold of them and stuff them back in. I never thought I would do that, but I did. I moved over to the fire to keep warm but also to get closer to what was going on. I thought I might be able to see or hear something about Jesus. Gathered around the charcoal fire, they recognized me. Someone said, “You are one of his disciples. You are one of his friends!” “No,” I answered, “I am not!” I don’t think they believed me, and I didn’t even believe myself. Why am I denying I know Jesus? What is happening to me? Where is this coming from? And then the rooster crowed, and I hit the wall. I came to myself and recognized what I had done. I left the courtyard and cried my eyes dry. I hated myself; I hated what I did. How could I ever forgive myself? How could Jesus ever forgive me? The charcoal fire on the beach flooded my soul with those horrible, horrendous memories. I wish I could make them go away. I want a “do-over,” but that don’t exist. It is hanging out there in the air, at least that is how I feel. It is the elephant in the room at our breakfast table. And no one is saying anything about it, not even John. The first words out of his mouth crushed me! “Simon, son of John,” he said. He did not say “Peter” but “Simon, son of John.” When we first met on these same shores several years ago, he called my name, “Simon, son of John.” But then he renamed me, “Cephas” (“Peter” in Greek), which means “Rock.” He called me a “Rock,” but not today. This not-so-subtle address forced me to face myself. I thought of myself of a “Rock” among the disciples. I had a heroic self-image laced with arrogance and impetuousness. I thought my role to play the hero, but several nights ago I learned I was no hero. It was a façade, an illusion. I’m no hero; I have feet of clay. I was so startled by the address that I almost did not hear the question. “Simon, son of John, do you love (agapas) me more than these other disciples?” I looked around the fire at my fellow disciples and friends, including John. There was no way I could say I love Jesus more than them. I knew myself well enough to know that. At least the arrogance was gone…at least for the moment. Several weeks earlier I would have anointed myself the greatest. I boasted I would follow Jesus whenever he went. I told him in front of all the disciples that I would die for him. I thought I loved him more than the others. But no longer. I will not overstep this time. In fact, I realized the question is confrontational. Jesus knows the contrast. He knows what I did. He forced me to face myself, to look at myself in the moment, and to take inventory. Who I am? Whom do I love? Why did I change the verb? I wanted to stress to Jesus how deep my love was. I wanted to assure him that now I would die for him. Several weeks ago, when we were sitting at the table with Jesus, he called us his “friends” (philous) rather than his servants. He told us there is no “greater love (agapen) than this than to lay down one’s life for one’s friends” (philous). Jesus asked me if if Ioved him, and I told him I would die for him. Then Jesus startled me. “Feed my lambs,” he said. What? I couldn’t imagine feeding lambs; I couldn’t imagine participating in your flock. I was so ashamed and so grieved; I only wanted to sit in the back unobserved and unnoticed. I feel so unworthy to feed Jesus’s lambs. And I remembered how several months ago Jesus told us a good shepherd lays down his life for the sheep. The invitation stung me. Jesus did not let up. He asked another question. This time he dropped the comparison, and the question became more pointed and more direct. “Simon, son of John, do you love (agapas) me at all?” It is almost as if he was asking me if I have ever loved him, and I understood why he asked. I failed him in the most crucial moment of my life and his. In the crucible I showed myself faithless. Do I even love Jesus at all much less love him more than the other disciples? Jesus was probing me. He was performing a kind of heart surgery on me. Do I know myself as Jesus knows me? When I denied Jesus, I loved myself, and maybe that is still true. Again, once again, Jesus invited me into his community; he invited to participate. He said, “Tend my sheep.” I can’t even go there now. That seems so distant to me; I feel so unworthy of such a charge. “Lord,” I responded, “you know everything—you know my heart now just as you knew it on the night I denied you. You know I love you. You know I will die for you.” I know Jesus knows. He knew my heart several weeks ago, and he knows my heart now. In all these questions, Jesus’s voice was strong and stern. I knew Jesus was confronting me with my sin, but I also knew he was inviting me into his community again. Again, he welcomed me to “feed his sheep,” to live as a shepherd among his flock. Again, I recoiled. But then it dawned on me what Jesus was doing. Jesus was not torturing me or rubbing it in. The three questions paralleled my three denials. Jesus gave me the opportunity to reverse my denials as a way of repairing my past. He gave me a “do-over.” He walked me through a kind of repair therapy, moral repair. I re-enacted my denial. Jesus helped me repair my past. With each question, I looked my past in the eye and acknowledged what I had done. With each question, Jesus embraced me in the present. With each question, Jesus offered me a new future. Jesus walked me through a process of moral repair, a kind of spiritual therapy where I looked in the mirror and faced myself. Through that confrontation, I confessed my failure, recognized my woundedness, and Jesus reoriented my life toward healing. Jesus did not say to me, “Its okay; it didn’t matter. No worries.” Just the opposite. I had to face what I had done, and I had to see myself for truly who I was. Even as I professed my love for Jesus, I tasted the bitter fruit of the denial. I recognized my false self, my heroic self-image, and I reached out for my authentic self in professing my love for Jesus. This did not erase my past. It really happened; it’s not going away. But the grace Jesus offered in this moment—as painful as it was to hear it and embrace it—reframed my past. It is like it rewired my experience. I still acknowledge the past, but I now see it through the lens of grace and how Jesus calls me into a new future. The past is no longer debilitating; the shame is no longer incapacitating. I have a future with Jesus. Jesus confronted me in order to embrace me, and he embraced me to offer a new future, a future without shame, guilt, and grief over my past. And Jesus really does know me. He knows I will face my next crucible without wavering. When I am old, someone will bind my hands and take me where I do not want to go. Jesus knows when that day comes I will die for him. My name is John Mark Hicks, a disciple of Jesus. I am Peter….and so are you. You are currently browsing the archives for the Biblical Texts category.